It seems that the Village People were onto something with their hit “Go West,” as several massive projects inject billions of dollars into the City of Parramatta, transforming Sydney’s second capital in the process. This confluence of once-in-a-lifetime infrastructure projects has sparked a frenzy of interest in commercial, industrial, and residential property. 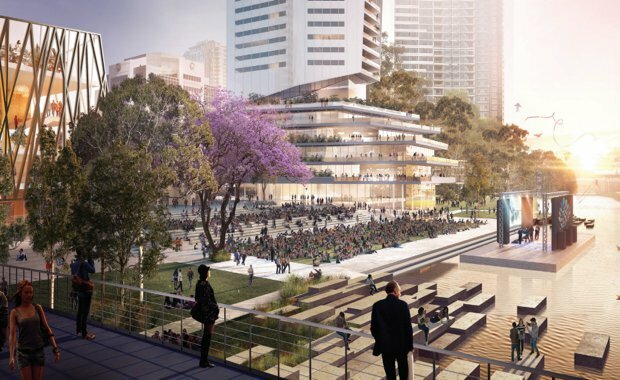 One of the largest urban renewal projects in the country, Parramatta Square, will see Parramatta City rival Sydney’s CBD, with a total of $8 billion to be invested city-wide in buildings and infrastructure over the next four years, reports The Urban Developer. The three-hectare project will comprise mixed-use twin commercial towers offering 110,000 square meters of A-Grade office space, 3,000 square metres of retail space over two levels, and an underground link to the Parramatta railway station. The project also includes the tallest proposed residential tower in the southern hemisphere — the Aspire Tower — with up to 700 apartments, a hotel, and ground level retail. However, Walker Corporation and Parramatta Council have agreed to changing the dominant use of the Aspire Tower from residential to commercial, creating an extra 10,000 jobs and 71,000 square metres of A-grade office space, much of which could be gobbled up by NSW government departments. The project is coming at a good time; Parramatta has zero office vacancy for A-grade properties and tenants are moving into B and C-grade sites just to get a presence in the market, reports the Sydney Morning Herald. The wider precinct will feature the 26,000-square metre University of Western Sydney Campus housing for more than 10,000 university students, as well as community facilities, a civic building, community centre, library and a 250-metre-long public domain in the heart of the city, seen as critical to the activation of the project. The AFR also reported this week that architects Fender Katsalidis would build a $230 million 20-storey-plus office tower at 32 Smith Street, Parramatta. Located on a site next to the Parramatta River, this collaboration between the City of Parramatta and the NSW Government will include a relocated Museum of Applied Arts and Sciences (Powerhouse Museum) due to open in 2022, and an enlarged and upgraded Riverside Theatre. Deloitte estimates that the cultural precinct could draw up to one million local and international visitors a year and inject between $106 million to $422 million into the region, creating between 150 and 600 jobs. A new rail line from Westmead to Carlingford via the Parramatta CBD is expected to open in 2023, reports the Sydney Morning Herald. Stage one of the new network connects the major health precinct at Westmead to three campuses of the University of Western Sydney, Parramatta North, new revitalised places in the Parramatta CBD, upgraded schools, Rosehill Racecourse as well as the new Western Sydney Stadium. Planning work for stage two of the project, from Camellia to Strathfield via Sydney Olympic Park, is being developed in collaboration with Sydney Metro West. Stage two planning work is expected to be finalised by the end of 2017. The SMH says the government plans to fund the project to the tune of $1.6 billion through a “value sharing” levy of $110 a year on residential and commercial development with 800 metres of rail stops and a 3 per cent land tax on properties in the same area. Part of Sydney Metro, the biggest urban rail project in Australia’s history, Metro West will connect the Parramatta and Sydney CBDs, linking communities along the way and producing more than $11 billion of public benefits, claims a Cabinet paper seen by ABC and Fairfax. Metro West will cost up to $15 billion to build and about $2 billion to operate over 30 years. The government hopes eager property developers will help foot the bill by purchasing air-space above new stations and on rezoned government land nearby, an approach expected to boost economic returns and save up to $1.5 billion in losses over the life of the project. Sydney Metro estimates that Metro West will service an extra 420,000 people between Greater Parramatta and central Sydney over the next 20 years. Billed as the largest transport infrastructure project in Australia, WestConnex will greatly improve road connectivity and capacity between Parramatta and eastern Sydney. The massive project will remove bottlenecks and relieve road congestion for hundreds of thousands of commuters; directly and indirectly delivering over 10,000 jobs, and creating opportunities for urban renewal and green space. WestConnex is a part of the NSW Government’s $73 billion infrastructure program to tackle congestion and ease the freight task across Sydney’s west.